To some, including Mr. William Faulkner, the greatest novel ever written. 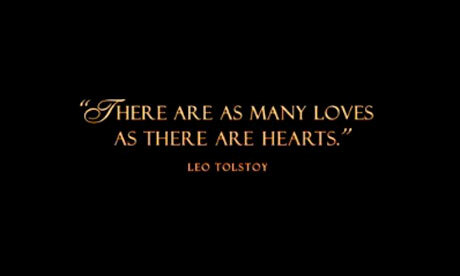 Leo Tolstoy tells the story of a doomed love affair between Anna Karenina and military officer, Count Vronsky. However, as soon as one ventures beyond the cover, several major characters come into play. The loveable, niave ‘Kitty’ Shcherbatskaya. Practical and warm-hearted Konstantin Levin. ‘Stiva’ and ‘Dolly’, Sergei Ivanovich and of course, Alexandrovich Karenin. If you were unable to tell from the unique names, Anna Karenina was originally written in Russian. The excellent translation of Pevear and Volokhonsky (better than most, I’m told) was able to convey the tone of Tolstoy’s characters and insight to his interest in agriculture, politics and philosophy. Before I started reading, I was fairly unfamiliar with the plot. And even after the recent movie preview, I’m sure there are still quite a few who don’t realize Tolstoy’s story goes far beyond the passionate affair of Anna and Vronsky. Part One begins with Stiva, Anna’s brother, and his broken-hearted wife, Dolly who has discovered her husband’s affair. (You’re probably thinking, ‘Geez, more adultry.’) As it continues, a number of relationships begin to appear. Levin, a good friend of Stiva’s is madly in love with Dolly’s younger sister, Kitty. Kitty is being courted by Vronsky, who has no intentions of marriage. Along the way, Tolstoy reveals each of his interests with distictive insight and witticism. Often through Levin, as he struggles to find superior ways to manage his farm, understand the elections of provincial leaders and come to terms with his own ideas of faith – which is why his work is recommended for even those who are not romantic. Just a few reasons why it would be wonderful to read the original publication. A feeling of contentment perfectly describes how I felt once I finished all 817 pages (don’t let that deter you ;)). Although difficult to get through at times, it left me with a sense of accomplishment, warmth and solemnity. It also further proved how inverted my emotions are as I found the bit about Sergei and Vasenka’s proposal almost more depressing than Anna’s fate. I’m not sure I would go so far as to call it the greatest novel of all time, but you definitely have something to be proud of Mr. Tolstoy. Read it – All or Nothing. It is hard to believe that I have not posted a thing for about two months. I have missed it, which is why I am writing this – not to share a review or recommend the next best novel, but to simply get active once again. This post will not be completely useless, however. I have been rolling thoughts and ideas about the “Sundays” portion of my blog around in my head for sometime now. Due to the complicated schedule of a working college student, I have renamed that section or study to “Works of Faith” to delve into deeper understanding of God’s Word at anytime. I should also tell you that starting out with MacArthur’s Twelve Extraordinary Women is one of the hardest things I’ve ever had to read, for very personal reasons. For those of you who don’t share my faith, I could never, ever judge you, and know that I am so glad of everyone that reads what I choose to share with the world and offer their own opinions.